Eurus wheels were designed for extreme versatility: light when climbing and responsive when there is a change of pace, they adapt to all pedalling styles and every kind of terrain. Now, thanks to the new oversize flange and the innovative Mega-G3, Eurus wheels have seen a "leap in quality", becoming one of the best aluminium wheels for racing bicycles on the market today. I'm on my 10th year on a set of these. I'm in a fairly flat region and brake very lightly so there has been little rim wear on the brake track. There are probably 30,000 miles (48,000 km) on them. They have never needed truing. They are light enough to race and obviously durable. I am about 190lbs and a sprinter so they have had plenty of strain. They climb well and are very laterally stiff. These may be the best value in wheels out there. These wheels are excellent, Spin beautifully and are quite stiff so all the power generated goes to the road as it should. They are light and the spoke pattern on the rear wheel sets it out in a crowd. (cool). I have nothing but "high praise" for this dynamic wheel set. 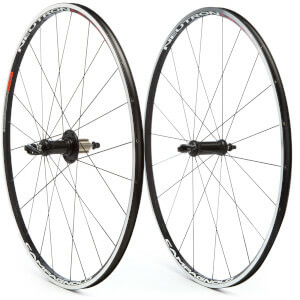 I am familiar with these wheels because I've ridden on them for two years on my Colnago CLX 3.0. This wheel set is rugged and durable to be so light. When I saw them on sale at PBK, I just decided to purchase another set for my Ridley. They are great for climbing. I do a fair amount of climbing and highly recommend these wheels. You will not regret buying Campy Eurus Wheels for any road bike you own! Perfect all-around wheel set. Light durable and arrives complete with wheel bags & skewers. Nearly 2 pounds less than then my previous wheels and what a difference. Faster spin up and a smoother ride who could complain. Great price, awesome. Very nice wheels. They arrived as expected. The bearings roll nicely. The tires mount without any issues. The wheels are remarkably well balanced, with no vibrations during my 70 km/h decent. Only a few hundred km on them so far, but they perform very well.